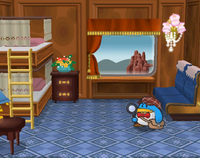 Pennington (or, as he prefers to be called, The Penguin with The Improbably Large Brain) is a Bumpty detective from Poshley Heights in Paper Mario: The Thousand-Year Door. Mario first meets Pennington on the Excess Express, where he takes Mario (whom he mistakenly refers to as Luigi) under his wing. Pennington and Mario must solve the many mysteries that occur on the train. Of course, Mario solves all the mysteries with no help from Pennington, who often takes the credit for solving them and treats Mario as an apprentice. His catchprase, "Rudimentary," bears resemblance to Sherlock Holmes's, "Elementary." When the Excess Express arrives in Poshley Heights, Mario heads to Poshley Sanctum to find the Garnet Star. However, the sanctum curator is unavailable and the entrance is locked. Though this is to Mario's dismay, Pennington soon arrives and unlocks the door, revealing that his real profession is being the manager of the sanctum (being a detective is just a hobby of his). Although he is the curator of the sanctum, he does not know where the Garnet Star is located. The only item on display is a replica of the Garnet Star (which Pennington calls a "red herring"), probably to protect the real star from falling into the wrong hands. When everybody is cheering Mario on when he's fighting the Shadow Queen, Goldbob, his family, and Toodles are shown cheering him on, and they call him both "Gonzales" (Mario's Glitz Pit pseudonym that some of them knew him exclusively by) and his actual name, which causes Pennington to be surprised and ask if it's Mario or Gonzales. Even after Mario beats the Shadow Queen and returns to Poshley Sanctum, he first calls Mario "Luigi" again but quickly corrects himself. (Excess Express) That's Pennington, a train passenger. He SAYS he's a detective, but I don't know... I mean, why do detective types ALWAYS show up when something goes wrong, huh? (Riverside Station) That's Pennington, a train passenger. He SAYS he's a detective, but I don't know... Not to be, y'know, totally catty, but what kind of detective LOSES a suspect? French Pingrot Comes from "pingouin" (penguin) and "Poirot"
Italian Holmut Pun on "Holmes" and possibly "Poirot" or "Helmut"
Francis in Super Paper Mario has a Pennington plush doll. Whenever Pennington says the word "Luigi," it appears in green text, as previously seen in the Mario & Luigi series, where Luigi's and Baby Luigi's names and nicknames are almost always written in green. When all the game's characters are cheering on Mario before the fight with the Shadow Queen via the Crystal Stars, he says "Go Luigi...err...Mario?" Pennington's character may be a reference to Hercule Poirot from 33 of Agatha Christie's murder mystery novels. In the Italian translation, his moniker is "the penguin with the little pink brain cells," a reference to Hercule Poirot's "little grey brain cells." This page was last edited on February 10, 2019, at 05:04.